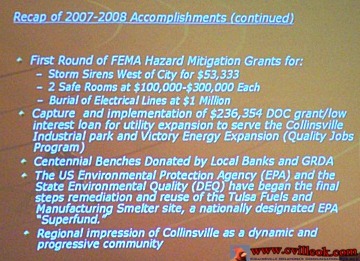 City Manager Pam Polk presented slides and photos to the Collinsville Chamber of Commerce summarizing a year of significant changes for Collinsville. 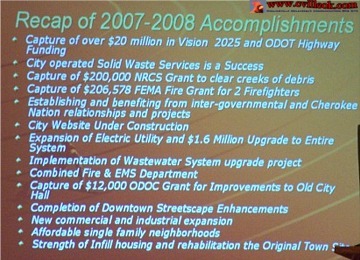 These changes ranged from recovering from massive ice storm damage; a new 4 lane east gateway & bridge; downtown streetscape improvements; to funding received for a list of continuing changes planned for coming years. Many of the projects are listed in summary charts below. A portion of the new design for the S-Curve (currently in review by the City, ODOT & Tulsa County) was presented in public for the first time Thursday. Mayor Stan Sallee discussed the possibility of future City Park improvement (including a splash park and skateboard park). 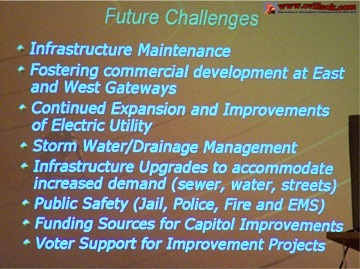 Funding for these and other city-wide improvements might be put to the voters to decide soon. 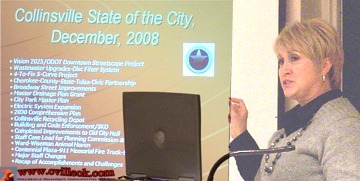 A commmitte of community representatives will first decide if this is the right time to take on these endeavors. Many material costs are down now but must be balanced with taxpayers' willingness to take on more during this economic downtown.